Dumpster Drummers, from left, Doug, Brandon and Larry. 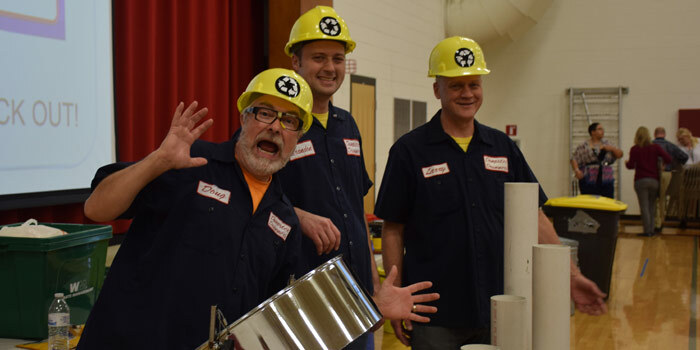 WARSAW — The Kosciusko Solid Waste District partnered with the Dumpster Drummers out of Fort Wayne to bring an entertaining recycling show to local elementary schools. 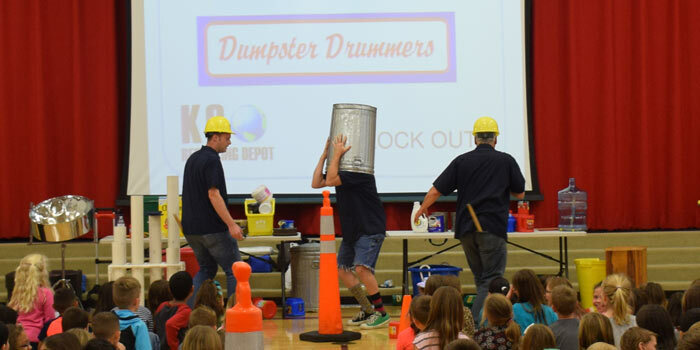 The Dumpster Drummers, currently a three person group of members Larry, Doug and Brandon, put on educational shows for students that focus on aspects of recycling and why it is important. Wednesday afternoon, Nov. 16, the group visited Madison Elementary School in Warsaw. The whole school filed into the gymnasium to see the show. KC Recycling Depot educator Sarah Fruit introduced the group. 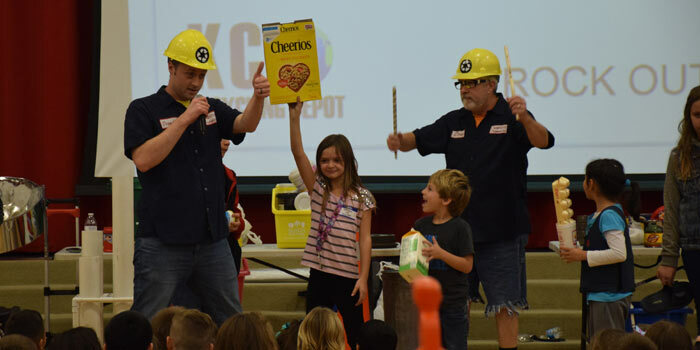 Fruit has worked with Madison Elementary and other Warsaw Schools doing lessons that teach kids about the different ways to recycle and why it is important. Those interested in Fruit’s available lessons can see the KC Recycling website. The show started with a fun drumming performance from the group, with all three members banging on recyclable objects and recycling bins. The trio are musicians who put on the recycling program as a side job. Dumpster Brandon took over, leading most of the show, telling kids what is and is not recyclable. 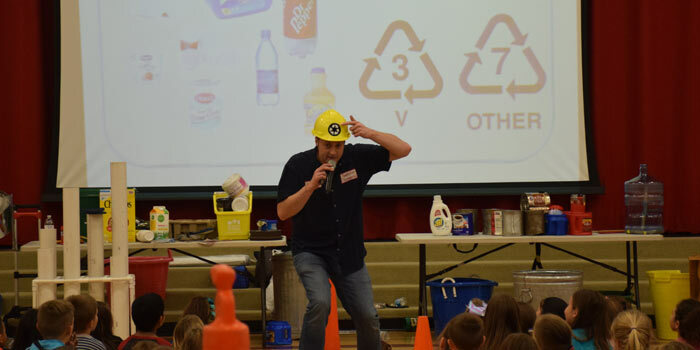 He went over what plastics, cardboards and metals are recyclable and how to tell the recyclability of plastics by looking for a recycling number, as well as pointing out non-recyclable objects like shoes, waxy cardboard and most toys. Brandon then took ten volunteers and gave them each a random item. Volunteers had to hold up their items and kids in the audience had to say whether or not the item was recyclable. Brandon explained to the kids that sometimes only part of an item is recyclable, like how cereal boxes are recyclable but not the bags inside. Dumpster Doug helped out by naming ways to reuse non-recyclable materials, such as using plastic shopping bags to clean-up animal waste. 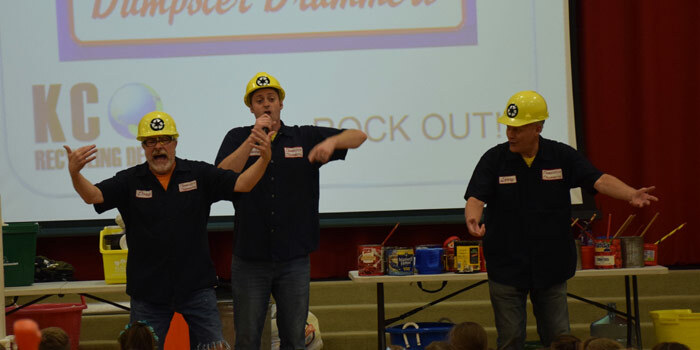 The educational program was a hit, throughout the show kids could be seen dancing and giggling. For more information on the Dumpster Drummers visit their website. The trio’s antics had kids laughing throughout the show. Kids in the audience had to shout out whether items were recyclable or not. The Dumpster Drummers motto is Reduce, Reuse, Recycle, Rock Out!